Catherine Gibbon has me thinking more and more about developing a vision to direct my work. She also suggested that I find a place that I have a strong attachment to and start painting there regularly. I have been pondering both. Last week our class painted in Warren Park which is right at the end of our street and was a childhood haunt. I had an epiphany. 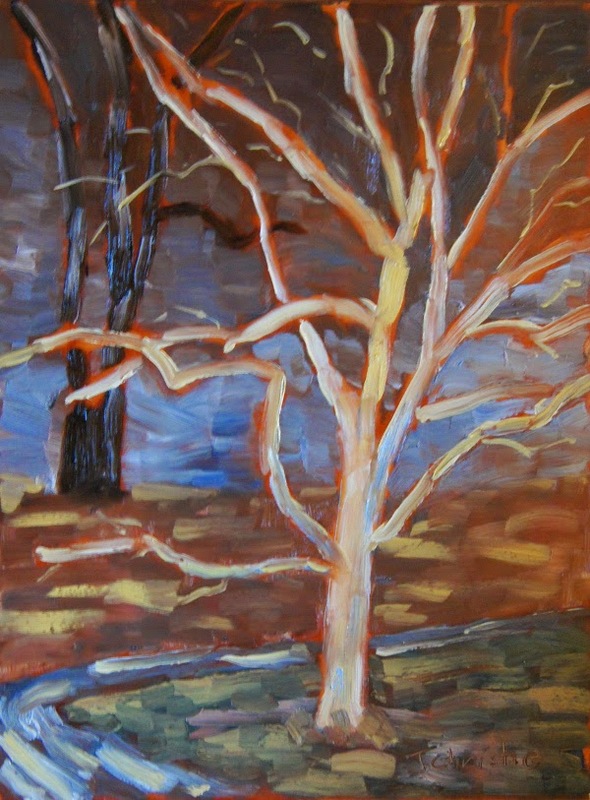 I have many fond memories of that park and I love trees with all their distinctive personalities so why not do a series of paintings of trees in Warren Park. This painting was painted Monday at Princess Point. It was pouring rain when we got there and only three of us stuck around. The rain did stop and we even got moments of sunshine which lit up this sycamore tree in front of a very dark and angry sky. If I had used my brush strokes to show the contours of the ground this would have been much better. This tree was a huge old willow painted in Catherine's class on Tuesday. It was very cool in hue and the background was very warm. I struggled to make this work to no avail and actually scraped off more paint than I put on this board. 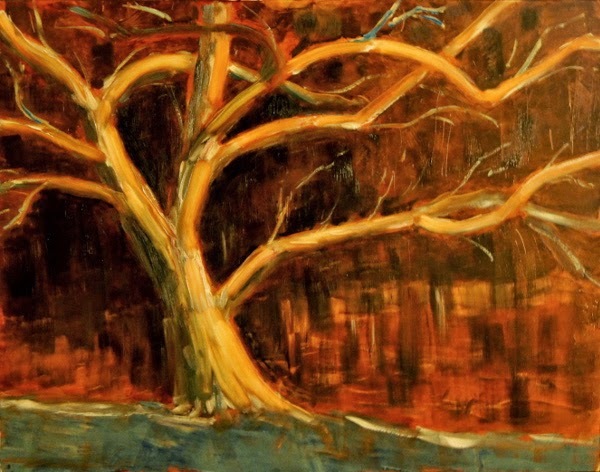 I realized with this painting that I need to paint portraits of trees and not just trees. I hear Catherine saying "Don't paint a tree. Paint that tree." I felt that I need a change so on Wednesday I took my watercolours to the sketch group. The model was Melissa with her three month old daughter Ellie. She was looking down with a look of pure adoration and I wanted to capture that feeling. It has been quite a while since I painted a portrait in watercolour and I wasn't very successful but it was fun I plan on using them more when we have portrait models. Yes the baby's head is much bigger that I made it. I was always concerned that I would paint too much and burn out but the opposite is proving to be true. I have become addicted to painting. Four of us painted outside today. Oh what fun. It was -10 C with a gusting wind that drove the temperature with the wind chill to -23 C. My oil paints got thicker and thicker until they finally froze solid enough that I could no longer work with them. This will be my third winter painting outside with oil paints and this is the first time ever that I couldn't paint. This is what my palette looked like while I was working. The problem may have been more the blowing snow mixing with the paint than the actual cold. When I could work it the paint was more like wet sand than paint. This is my painting on my easel. It is far from finished but it is as far as I could go with it and there is so much snow mixed in with the paint that it will be a mess when it thaws. I would love to carry this farther and especially darken and grey the tree which is way to brown but the whole thing is far to unstable to even think about it. This is the view that I was attempting. It is just outside an artist friends back door so I was tempted to duck inside but it is better to just get used to the cold. It sounds as if it was a miserable experience but I had a blast. I was outside surrounded with snow holding a paintbrush. I still love my job. Most of the reds and oranges are long gone but the yellows and golds just keep hanging on. We didn't have much of a summer but this fall is fantastic for those of us who paint outside. Monday we were at La Salle Park and I forgot my non darkening glasses so I struggled with the colour and values in this one. I tried a new method of painting and rubbing out and I am sure it will work quite well with practice. I thinned the paint too much when I started the sky so it is a bit muddy but I will keep working this way because it is fun and different. Tuesday we went to Tew's Falls and the Spencer Gorge for Catherine Gibbon's class. It was very windy and started raining a bit towards the end. I am not at all happy with this painting. I couldn't decide on a good composition and instead of sorting it out I just started painting. I know better than to start a painting with important issues unresolved. A long narrow board would have been better too. I was at Princess Point at eight thirty this morning and glad that I was. It was very damp and misty and about 6 C but the view was to die for. There was still some colour in the distant hills and Coote's Paradise was like glass so everything was reflected in it. I kept the horizon low so that I could keep the damp hazy feel to the painting and I think that it worked okay. I would rather the sky was a bit warmer but other than that and the lollipop trees on the left I am very happy with this. I can and may fix those in my studio. I was always concerned that if I started painting too much it would become work and I would lose interest in it but the exact opposite seems to be happening. The more that I get out and paint the more I want to get out. I have had a busy week. I painted Monday (1 painting), Tuesday (3) Wednesday (1) and Thursday (1). Unfortunately I struggled with all of them and I am only really happy with one. We were at La Salle Park on Monday and I elected to paint the birches behind the sailing school building. This turned out all wrong because I started off with the birch trunks too fat and and the building too big. I also couldn't decide what to do about the white building behind the white trunks, I almost didn't post this but it is all part of the process. Catherine Gibbon's class on Tuesday was in a very inspiring location. I was there from nine in the morning until five in the afternoon and struggled the whole time. This is the best of my three paintings and I don't like it. I used violet for the sky and the trees to set off the yellow of the leaves however I made it much too purple. Why is it the more inspired I am the more I struggle? Wednesday was the sketch group and it is just plain fun. This is Udo. He sniffled and chewed gum the whole time that he posed but for me that is no big deal. He is a character and fun to paint. Thursday was a better day. We were at Princess Point shortly after eight and the sun was just coming up over the hill when we got there. When I started this everything was in shadow except the tops of the poplars and they were brilliant. I am happy with this one. I think I captured the feel of a bright but chilly fall morning.